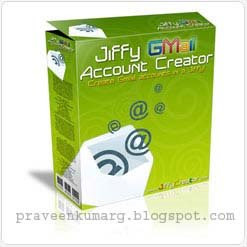 With Jiffy GMail Email Creator Software you are able to better utilize the world’s best email service. For an unlimited amount of reasons, you might need to mass create GMail email accounts. Gmail is Google’s free webmail service. It comes with built-in Google search technology and over 2,600 megabytes of storage (and growing every day). You can keep all your important messages, files and pictures forever, use search to quickly and easily find anything you’re looking for, and make sense of it all with a new way of viewing messages as part of conversations.